Portland is no stranger to creative cellos, but Geographer's Nathan Blaz has a knack for achieving some unexpected sounds from his stringed instrument. "I realized the other day that nobody is really doing what Nate is doing with the cello," says bandmate Mike Deni. "He uses both electric and acoustic, and runs it through effects and gets some extremely abrasive distortion out of it as well as just gorgeous delay textures. We worked a lot with our producer Eli Crews to achieve these sounds, all of us standing around tweaking the pedals and amps together." 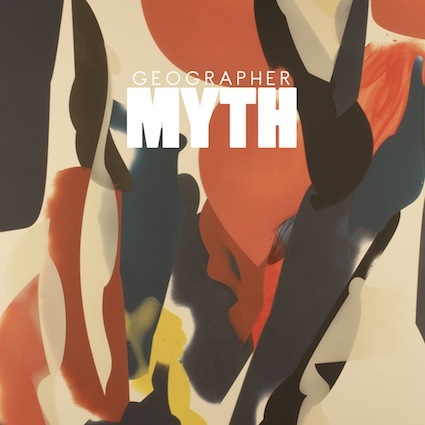 Deni is talking about the San Francisco three-piece's second full-length album, Myth, which came out yesterday, February 28th, on Modern Art Records. Working with Crews (tUnE-yArDs, Beulah, Why?, Deerhoof) and mixer Chris Zane (Passion Pit, Walkmen, Holy Ghost!, Tokyo Police Club) at John Vanderslice’s Tiny Telephone Studio, the team of Deni (vocals, synth and guitar), Blaz (cello) and Brian Ostreicher (drums) crafted 10 intricately beautiful, electronic-based tracks full of Deni's drifting, spectral vocals and bright synthesizers contrasted by Blaz's, often darkly, atmospheric cello layers—a cello he manipulates like an electric guitar. And it's all backed up by Ostreicher who crafts beats that'll make you dance or slip into a trance. But now the multi-instrumentalists have another complex set of songs to map out for the stage as they join The Modern Art Tour with Miniature Tigers, The Chain Gang of 1974, and Pretty & Nice at Branx on Friday, March 2nd. Looking to chart more new territory, Deni recently said, "We want to make sounds that nobody's heard before." Where do the ideas for these sounds come from? Deni: The ideas are usually generated from diving into the instruments and pedals. Just from playing around with different combinations and effects as we're building the song from the ground up. Later on we might chase ideas that are in our heads, but most of the initial sounds are from experimenting. Your music has an eerie but beautiful spectral quality that lives in the levels of intricate layers on Myth. Tell me about your process for developing and creating this sound in the studio? I think a lot of it has to do with the array of vintage pedals at Tiny Telephone. John Vanderslice is a man of many talents, but one of the ones I admire most is his ability to acquire unique gear. We spent a lot of time matching each particular cello and guitar sound to a unique amplifier. We tried to never use the same combination twice, and make sure we weren't being lazy. As far as specific gear we used, that's a trade secret. On Saturday, March 3rd, Oregon Music News and Octopus Entertainment will team up to send off two rising Northwest acts to SXSW. And in doing so, the indie rock invasion at Jimmy Mak's will kick off with Andrew Paul Woodworth—the LA via PDX via LO singer/songwriter who is also an OMN writer... and now broadcaster. As alluded to by Andrew, the Portland four-piece Archeology write "desert hymns" full of foot-stomping, hand-clapping, and chant-along melodies. Drum circle-inspired beats combine with playful, jangly touches and singalong lyrics. Including lead vocalist and bassist Daniel Walker, guitarist and vocalist Jason Davis, drummer Benjamin Haysom, and lead guitarist and vocalist Zach Dilday, listen to a few of Archeology's multi-layered, multi-part harmonies in our OMN/Octopus show sampler below, including a new track, "Piaute," from their latest EP Gamebird, which available at the gig followed by a post-SXSW digital release. 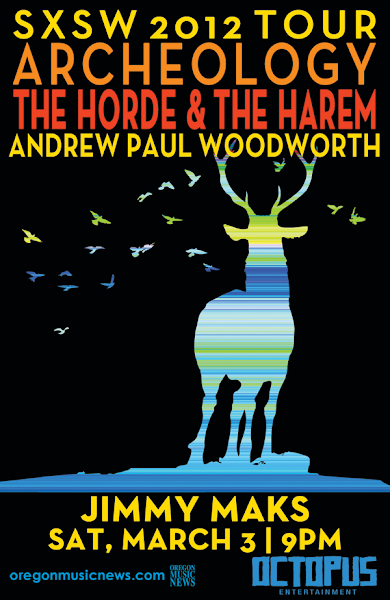 March 3rd will be Archeology's last home gig as they look south (aka Austin-ward), taking to the road with Seattle's The Horde and the Harem for a month-long trek to SXSW. THATH (not to be confused with the slightly more famous Seattleites THATH) will also be celebrating the release of their debut, full-length debut, A Long Midwinter, at Jimmy Mak's. The guitar/bass/keys/drums five-piece are known to include an exuberant horn (as heard in "Chasing Crows" above) as well as back-and-forth vocals shared by four singers—those not wielding sticks. Warming up before the Jimmy Mak's release gig, The Horde and the Harem will take the record store stage at Music Millennium on the afternoon of March 3rd at 3pm. And warming us all up will be none other than the Andrew Paul Woodworth. 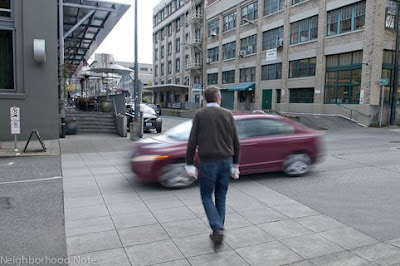 The LA via PDX va LO singer/songwriter is back in the greater Portland metro area... to stay? Read the rest and win tickets on OMN. Networking doesn't have to feel like a sale. Or an awkwardly ostentatious forum for egotistical schmoozing and one-upmanship. Networking should feel more like socializing—finding common interests and then sharing ideas and solutions to problems—especially in Portland's diverse but cooperative small business culture. So-called networking "events" shouldn't even necessarily be formal affairs or paid conferences, but rather a real, honest encounter where you can develop professional collaboration or even a friendship. And while networking often means breaking out of your shell and putting your best foot forward, many difficult situations in life are also moments of growth and require going outside of your comfort zone. But, you can use new school, digital means to initiate contact with the groups and individuals you're interested in approaching before tackling the in-person encounter. Many small business education opportunities are also great places for networking, but here are few more ideas to help you find the like minds that surround you in your own city. Social media networks provide immense opportunities to find others with similar tastes and cultivate online relationships. These relationships don't take much effort and there's no cost. Social sites like Facebook and LinkedIn have both private and public groups for every field imaginable. Start with an alumni group or widely recognized association or even just search the listings until some piques your interest. A site that's even more specific is Biznik, a community of independent business people, where you can create a profile, add friends, join conversations, and find events to attend. Then, the interaction is up to you—simply follow along to see what others are talking about or interact, communicating with people without even joining a paid-group and then feeling bad because you never attended any events or mixers. Get more networking tips on Neighborhood Notes. Portland's micro coffee roasters and our D.I.Y. spirit in the press is nothing new. And last week The New York Times' travel section gave another tip of the hat to what it called Portland's "D.I.Y. coffee culture." 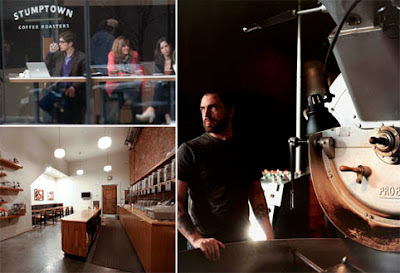 Did The NYT cover a few of our great, local micro roasters? Yes. But our D.I.Y. coffee culture? Not so much. Not sure how they are defining D.I.Y.! The only roasters mentioned are commercial roasters. Really good roasters, Sterling Coffee Roasters, Coava, and Heart, but they produce coffee for others, not really the idea behind do-it-yourself. Maybe 'buying your own' is how they define D.I.Y. in New York. Still, being the proud Portlanders that we are, it's nice to see some of our local favorites noticed by one of our nation's most prestigious news outlets. But beyond the rich coffee and trendy culture, there's a better reason for all this back patting. The New York Times taking note of Portland micro roasters highlights another facet of our robust, small businesses community—one that not only fuels our city with java but also economically. And, you too can stimulate our local economy with your money, voting with your dollars by supporting local coffee roasters rather than corporate coffee like Starbucks. It'd be quite a task to feature them all (one count put the list at more than 30 local micro roasters), but we have to start somewhere. So, here are three Portland micro roasters with coffee shops that support local and in turn energize our economy through collaboration. And, must we say it again? Each is a superior, local alternative to Starbucks. Local and sustainable (it's called Courier because most deliveries are made by bicycle!) have been fundamental practices for Courier roaster Joel Domreis for eight years. Even though the coffee beans may come from afar, all of the shop's baked goods are made from scratch on-site using as many locally sourced products as possible—except the bananas, of course. Fresh produce often comes from the PSU Farmers Market and includes what's in season (strawberries, blueberries, cranberries, mushrooms), honey from Sauvie Island, and other ingredients from around the northwest, like Shepherd's Grain flour or organic products from Portland's Dovetail Bakery and GloryBee Foods in Eugene. The shop also support local artists, whether that's featuring prints from rotating artists, hosting small events, or letting friends sell items, like the Pendleton wool mason jar koozies currently available. Courier's traditional brown coffee cups may be exported from Italy, but "we've been getting batches of cups from [local ceramic artist] Gretchen [Vaudt] for a year and a half," Domreis says. And the Oregon-harvested, walnut bar came from "no more than 100 miles away," according to Domreis. With almost 100 regular wholesale clients, Domreis' product never leaves the city of Portland. You can find his joe at some 15 bars, restaurants and coffee shops and more than a handful of private businesses, but most of his clientele are individuals and Domreis' bike delivery team will leave a fresh bag of beans on your doorstep if you'd like. Those custom cargo bikes and parts come from the Eugene-based Center for Appropriate Transport while Courier itself tries to support other roasters by servicing espresso machines. "People know that we have parts inventory for certain things, so other roasters and other owners of businesses will call me up to borrow things," Domreis explains. "We're going out and helping other people out with their equipment problems." Courier is currently helping the local economy by employing seven people, creating seven local jobs—two part-time and the rest full—and making those jobs as busy and sustainable as possible. Without much money for an advertising budget or extraneous operating costs, Courier does what it can to save money on its own. Read the rest on Courier plus other PDX micro roasters, including Stumptown Coffee and Ristretto Roasters, on Neighborhood Notes. 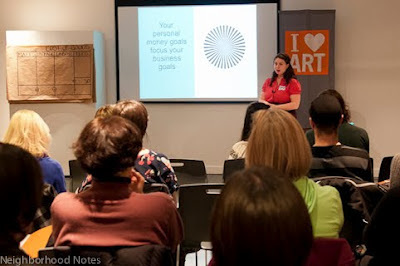 From multi-week courses to single workshops, a variety of small business education opportunities are available to all Portland entrepreneurs. Small businesses dominate the Portland marketplace, comprising 95% of all firms and employing 254,000 people, according to the Portland Development Commission. Yet, the PDC also points out that even though “our local economy is populated by thousands of small business enterprises, many... struggle for viability and survival while providing hundreds of thousands of jobs with billions of dollars in payroll." The best way to ensure you stay in business is to stay educated, whether that’s keeping up with the latest technology or learning a new skill to further expand your business. If you are looking to start a business or compete in an evolving marketplace, Portland offers many forums for small business education from traditional, multi-week courses to single workshops—and one that even serves cake! Neighborhood Notes has scoured myriad choices to compile a list of interesting and affordable education opportunities. If you’d just like to take a single, intensive class or join a group of like minds, the following inventive organizations allow you to drop in and out as your schedule allows. Although there are plenty of laggards out there, search engine marketing (SEM) is hardly some obscure industry; in reality, it’s easily the largest segment of online advertising. Google raked in $36.5 billion in advertising revenues last year, a 29 percent growth over the previous year, and SEMpdx is your local industry resource with a mission "to inform and educate area businesses on the benefits of SEM to bottom line revenue." Search Engine Marketing Professionals of Portland offers monthly events where professional talent comes together to learn and share ideas. 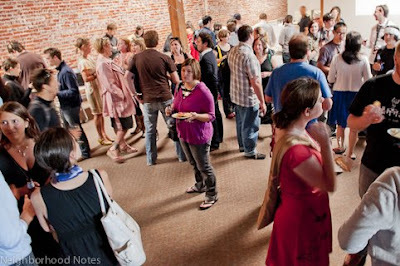 Most monthly events are open to anyone who wants to attend and prices range from $20-55, with discounts for members and registering early, plus SEMpdx's big search marketing and social media conference, the annual SearchFest now in its sixth year, is coming up on Feb. 24. Consulting And Knowledge Exchange has a simple goal: "We believe everyone should follow their dreams and if that dream is to own a business, we want to help." A fresh (now in its sixth week) organization, CAKE helps by organizing "a weekly series of Portland-based, donation-driven, down-and-dirty small business workshops and parties" where guest speakers serve up recipes on brainstorming, branding, market research and more in a casual environment—cake is actually served at every "party." Feel free to donate to the cause, ask tough questions you want answered, or even workshop your own project while picking up "scrappy business hacks for each topic" on Wednesdays from 6-8:30 p.m.
Find more small business education opportunities on Neighborhood Notes. Plus Portlanders M. Ward, Wild Flag, Portlandia The Tour, Greylag, and The Helio Sequence. Headliners include Jack White, Beck, Bon Iver, Pretty Lights, Tenacious D, Beirut, Girl Talk, The Roots, Feist, Metric, The Head & the Heart, Explosions in the Sky, Mogwai and so, so many more. And some other selections that are personally exciting are Spiritualized, Little Dragon, SBTRKT, Felix Cartal, Charles Bradley & His Extraordinaires, Com Truise, and Seattle groups Pickwick and Hey Marseilles. 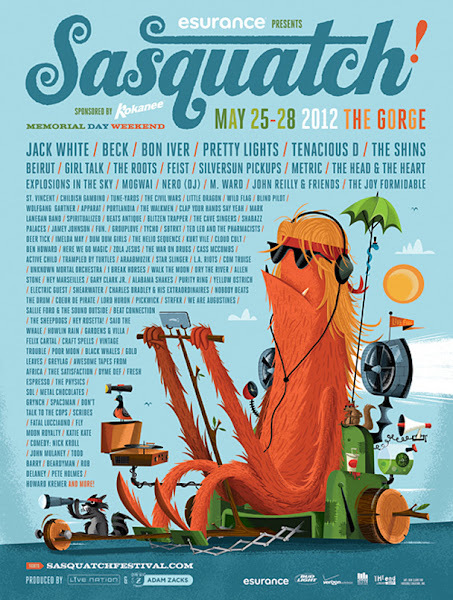 The 11th annual, 2012 Sasquatch! Music Festival takes place over Memorial Day weekend, Friday, May 25th through Monday, May 28th, at the Gorge Amphitheatre in George, WA. Get the complete lineup on OMN. "Pay what you want for the music you love. Even $0." Did you ever think a record label would tell you that? Tender Loving Empire founder Jared Mees isn't sure if his "priceless music" model will work, but he still believes the concept is worth exploring. "It's definitely not rooted in traditional capitalist commerce ideas," Mees admits. "It's rooted way more in how a relationship works. If I give you something for free, you're going to do something for me later." Acknowledging his own potential naivety, Mees maintains, "You have to do something risky if you want to get extraordinary returns." Enter The Priceless Music Project, Mees' innovative, game-changing endeavor that aims to implement a new form of e-commerce where audiophiles can purchase music direct from indie record labels and bands, paying whatever they want while also gaining some insight into the music-making process and even being rewarded for spending above average to support the music they love. 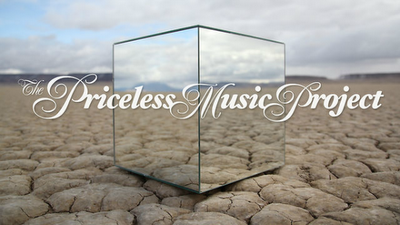 So, is The Priceless Music Project the future of buying and sharing music online? Mees doesn't know, but he's willing to find out. And, if you build it, they will come. But will they buy? Or just download for free? "A lot of this is just us hoping and praying but ultimately we don't have anything to lose. We're already in that situation," Mees laughs. "That situation" is the current state of the music industry, and the fact that, according to Mees, it can't get any worse. Mees has always had a unique, hands-on approach to his work in the music world. In building his multidimensional, hybrid business—Tender Loving Empire is a retail store, custom screen printing shop, and a record label—Mees has always tried to create community first and foremost, establishing relationships and educating along the way. Because of this, Tender Loving Empire is "an actual viable business" now. "If we weren't doing something that reflected the community, I don't think we would be doing as well as we are," Mees says. And Mees intends for same mentality and principles to guide The Priceless Music Project. "The goal of The Priceless Music Project is to allow music fans to get the music that they want to listen to for the price that they see is fair," Mees explains. "Also, to allow musicians and labels a different type of relationship with their customers and fans." His outlook involves more than a little bit of faith in humanity, trusting that dedicated music fans truly respect the independent artists who are making music and will pay for it. TLE first announced the project in early December along with a fundraising campaign, which expires in just under a week. Currently seeking $48,000 on IndieGoGo to fund the idea, The Priceless Music Project is not remotely close to that goal, but "this fundraising campaign is just one of the many ways to raise money," Mees says. "Our next move is going to be to basically bootstrap the development of this project so it works with our own website, let folks test it out, and see what it needs. And then, hopefully, use that momentum to help drum up some more investment to take it wide," Mees explains. At the end of the day, this is a huge project that already has, and will have many more, advocates and critics as everyone from musicians to fans to industry people each have their own opinion on the concept of pay-what-you-want music. The current idea is completely in-house but it will need much more than just TLE behind it to get it off the ground, and Mees is definitely seeking input from parties that would like to get involved. "We know that we have to branch out," Mees recognizes. "We are not the experts on how this should all work. We just know that something different needs to happen." As far as the current progress of the project: "In the scheme of things it's still early," Mees says. "Twelve months from now, I expect the platform to be at least a functional part of..."
Read the rest including an interview with Mees on OMN. Supportland co-founder Katrina Scotto di Carlo isn’t caught off guard: “Supportland is an experimental concept that has truly never been done, so it's not surprising that there's some head scratching,” she admits. 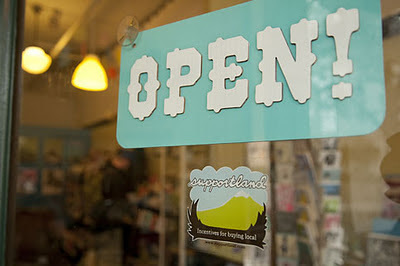 Supportland supports local. Or as Scotto di Carlo puts it: "Supportland rewards folks for doing right by their community." A rewards system for locally owned businesses and the neighbors who love them, Supportland helps its 101 participating businesses reward more than 30,000 cardholders with points. It's the equivalent of a supermarket club card or frequent flyer miles, but you're rewarded for patronizing indie businesses. You earn points for shopping at locally owned businesses and accumulated points can be spent on various rewards from any participating business. If you earn 50 points for making a purchase at a local boutique, you can turn around and spend 30 on a cup of coffee. Or put those points toward an oil change. Or fresh ink from the tattoo parlor. Plus, the Supportland card also functions like those classic paper punch cards, except you don’t have to stuff your wallet with a bunch of individual paper cards. Your Your Supportland card is like having dozens of punch cards in your wallet on a single card that automatically tracks all of your purchases. You can still get your punches without those hole-ridden, beat up pieces of paper. Learn more about how to use your Supportland card at Neighborhood Notes.